More than 3,000 people joined 210 Jesuits in Ho Chi Minh City on Sunday for the climax of yearlong celebrations marking the arrival of the first Jesuits in Vietnam 400 years ago. 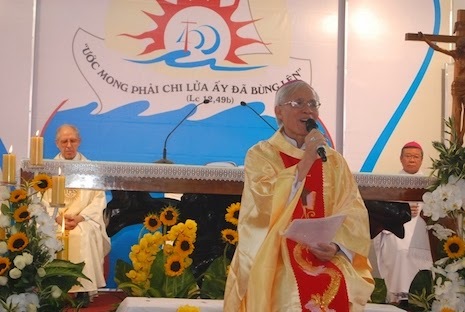 Bishop Cosmas Hoang van Dat, the Jesuits bishop of Bac Ninh diocese near Hanoi in Vietnam’s north, celebrated the Mass at the main Jesuits compound in Thu Duc, a suburb of Ho Chi Minh City. Fifteen bishops and Jesuits from Vietnam joined a congregation from across Asia and from Europe, including the Superior-General of the Jesuits, Fr Adolfo Nicolas, the Black Pope. Many celebrations took place over the last year with seminars, retreats and pilgrimages to places that were once significant Jesuits centers in the 17th and 18th centuries and Masses in parishes across Vietnam. The gatherings and events focused on the missionary experiences and strategies of the early Jesuits from their arrival — by an Italian and two Portuguese — in 1615 in the company of Japanese Christians who went to Cua Han near Da Nang to escape the persecution of Christians in Japan. While initially coming to serve the Japanese, the first Jesuits soon turned their attention to the Vietnamese people who were split into two kingdoms — Tonkin in the north and Cochinchina in the south. The Jesuits arrival in Vietnam came shortly after the death of Matteo Ricci in Beijing in 1610 and followed his approach to missionary work. Ricci’s revolutionary way of spreading the Gospel started with making friends among the local population and learning their language and culture before any effort was made to share faith in Jesus Christ. The most famous early Jesuit was a Frenchman, Alexandre de Rhodes (1591–1660), whose work led to the adoption of Romanized script for the Vietnamese language which is still used today. In 1661 he published the first Vietnamese-Portuguese-Latin dictionary and his Catechism in eight days, which presented the Catholic faith in the context of the traditional moral and spiritual beliefs of Vietnamese people. Some 158 years after arriving in Vietnam, the Jesuits were suppressed by the pope and disappeared from the country until their return in 1957 at the invitation of the South Vietnamese government to help develop universities. That was followed by requests from bishops in Vietnam to assist in training local clergy. That all changed in 1975 when the Vietnam War ended with victory for communist North Vietnam. Forty-one foreign Jesuits were expelled, leaving twenty-six Vietnamese Jesuits, half of whom went to jail almost immediately. The others were drafted into the army or put to work on state farms. Today there are 210 Jesuits in Vietnam with as many as 140 of them in training. The government restricts their activities so they are barred from working in schools, universities or social work, except if it is done in a clandestine way. As a result, many Jesuits have undertaken missionary work to Japan, Greater China, Laos, Thailand, Cambodia, Timor-Leste and European countries. The Jesuits are also preparing for the future in Vietnam by sending their young students for postgraduate studies in Europe and the United States.